Israel is a beautiful country with a thriving economy which makes it attractive to many tourists and foreign nationals around the world. In these groups are hundreds if not thousands of Canadians, some of which may need to provide documents to Israeli authorities to seek citizenship, secure employment, buy or sell property, or get married in Israel. Documents issued in foreign countries need to go through a process of validation to ensure they are legitimate. Without such a process, it would open the door to all manner of fraud, forgery, and theft. The original process of verifying foreign documents is known as authentication and legalization and this was used by many countries until the Hague apostille convention. This convention simplified the two-step process into a one step apostille process and many countries signed this convention including Israel. However, Canada has not signed the apostille convention. 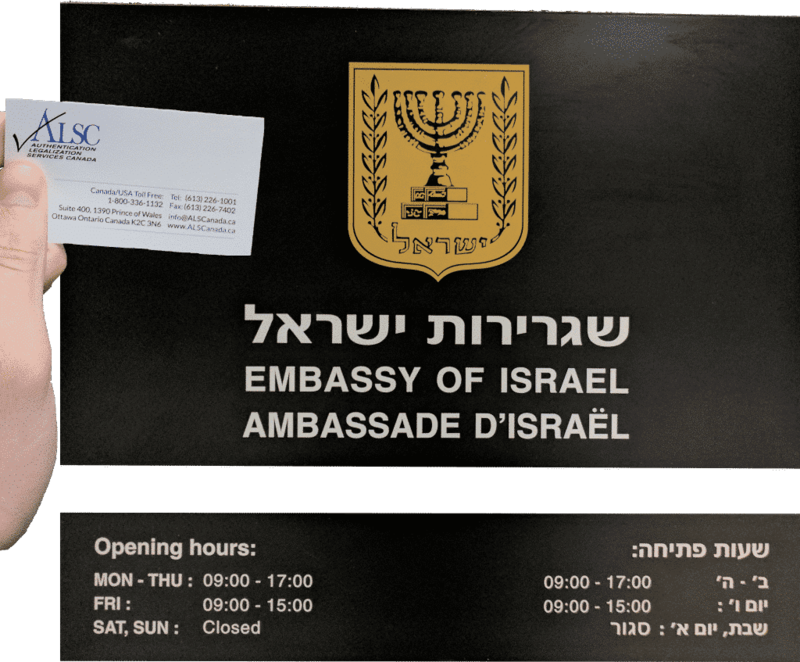 This can get confusing as many people are familiar with the apostille process and you may have been advised to get a Canadian apostille for Israel. This is not possible but authentication and legalization is equivalent to an apostille and will be recognized as such in Israel and almost every other foreign country which uses the apostille process. Let’s go through authentication and legalization in more detail. Authentication and legalization can seem confusing at first but it is actually very easy to understand. It simply involves validating the signatures on a document. Authentication takes place at Global Affairs Canada here in Ottawa and they verify the signature on a Canadian document by placing their stamp, seal, and signature confirming its authenticity. They can’t just authenticate any signature though, the signature must belong to an authorized individual such as a lawyer or notary public. Some Canadian documents such as Canadian vital statistics documents (birth certificates, marriage certificates etc.) and RCMP checks are issued with signatures that are recognized by Global Affairs Canada. Note that there are some additional requirements concerning these documents and they will be discussed in the next section. Once the requirements for authentication have been met, your document can be authenticated and is now ready for the second step of legalization which takes place at the consular section of the Israeli embassy here in Ottawa. The consul at the embassy checks the stamp, seal, and signature from Global Affairs Canada and puts his or her own stamp, seal, and signature on a certificate which is attached to the document which completes the legalization stage and makes the Canadian document valid for use in Israel. This seems like a fairly straightforward process but in practice it is not this simple. As briefly mentioned, Global Affairs Canada have requirements that need to be met in order for their agents to authenticate your Canadian document. These are often less extensive than those required by the embassy but there is a catch: it can take up to 20 business days for Global Affairs Canada to authenticate your Canadian documents. This is in addition to the shipping time between yourself, Global Affairs Canada, the Embassy of Israel, and back to yourself or wherever the document needs to go. The Israeli embassy also has its own processing time which can vary significantly as well as fees and requirements which change frequently. Authentication and legalization quickly becomes a headache. Delays are extremely common and without assistance it can take months to have your Canadian documents authenticated and legalized for use in Israel. We saw the need to provide a fast and affordable alternative to going it alone so that is exactly what we did. For over 25 years we have been processing Canadian documents for use abroad in over 100 countries including Israel. We have helped tens of thousands of professional individuals from famous actors to former prime ministers, as well as numerous international law firms, engineering companies, and pharmaceutical companies. We are experts in all Canadian documents from birth certificates, passport copies, RCMP police checks to corporate powers of attorney, certificates of incorporation, certificate of pharmaceutical products, and many others. Our frequent work with Global Affairs Canada, almost every embassy in Ottawa and dozens more across Canada has resulted in strong professional relationships that keep us up to date on changing requirements and fees and occasionally even in advance. This allows us to provide an even higher quality of service with minimal delays, a service which also guarantees that your documents will be made valid for use in Israel. Why use our services? We can reduce your processing time by up to 20 business days with our same day priority authentication service. We go in person on your behalf to Global Affairs Canada and the Israeli embassy here in Ottawa which allows us to ensure your documents have been processed properly and resolve any issues which may arise that would otherwise be impossible to do from afar. When you use our services our experts assist you in preparing your documents and any associated requirements for authentication and legalization. As the most accessible company in our industry, we offer free shipping via FedEx to our head office in Ottawa for processing when you use any one of our service centers across Canada. Once we have your documents and any associated requirements your only task will be to sit back while we send you detailed updates at every step of the process. Our professional staff will be here at all times during our office hours to answer any questions and address any concerns you may have during the process. Upon completion you can pick up your documents at any one of our service centers across Canada at no additional cost or have your documents shipped elsewhere in the world for an additional charge. The result is a stress-free authentication and legalization completed at a speed which is impossible to achieve without assistance and a level of professional service seldom seen in any industry. Our proud membership with the Canadian Chamber of Commerce, A+ rating with the BBB, and perfect 5-star ratings on both Google and Facebook are testimony to our commitment to service, quality and efficiency. If you have Canadian documents for use in Israel, contact us to get started. Continue reading for additional information on some Canadian documents commonly used in Israel. Resolving personal affairs in Israel will require a series of personal documents. These commonly include vital statistics documents such as Canadian birth certificates, marriage certificates, and death certificates. Other documents which may be required include affidavits, powers of attorney, authorization letters, and various other documents related to managing, buying, or selling property. Canadian vital statistics documents are issued by the province wherein the life event occurred. Note that this means that marriage certificates issued by the church or death certificates issued by the funeral home are not valid for authentication at Global Affairs Canada. As mentioned earlier, these documents are issued with signatures recognized by Global Affairs Canada, making them valid for authentication upon issuance. This means that they do not require any additional processes such as notarization by a lawyer or notary public. Notarized copies can be made but are not ideal since originals are always preferred for processing and it is usually less expensive to simply order a new original than to make a notarized copy. Most importantly, it is best to get the long form versions of these documents wherever possible. Smaller vital statistics documents such as wallet sized birth certificates are not valid for authentication at Global Affairs Canada. These documents may be referred to as registration of live birth or copy of an act of birth depending on the issuing province. There is a chance you are having difficulty finding your Canadian birth certificate, marriage certificate, or death certificate. This is quite a common occurrence as these documents are seldom requested for use within Canada, lending themselves to damage or misplacement over time. Luckily, it is very easy to order a new Canadian vital statistics document from the appropriate provincial vital statistics office. If you need to do so and will require your Canadian birth certificate, marriage certificate, or death certificate authenticated and legalized for use in Israel then we recommend you have your document sent directly to our head office in Ottawa for processing when you order it. This will save you time and many of our clients choose this option. Use the links below to order your Canadian vital statistics documents. In contrast to vital statistics documents, affidavits, powers of attorney and authorization letters will require notarization by a lawyer or notary public. If you already have your document notarized, take a minute to check that the stamp, seal, and signature are all legible and match otherwise Global Affairs Canada will not be able to authenticate your document. In many cases you can draft these documents yourself or with the assistance of your affiliate in Israel and then have a lawyer bear witness to you signing the document. However, it is recommended that you have a lawyer draft your document for you especially if you are resolving a matter concerning property. If you have a document for use in Israel that you believe is too valuable to alter or risk being damaged or lost, you can have a notarized copy made of your personal document for use in Israel for processing. We can do this for you when you use our services and there are many cases where this is preferred. Authentication and legalization is a mission in itself. A lot of people forget that this process is not like your every day errand. It takes many hours of planning, organization, and work to get it done properly and the chances of doing so are slim on the first attempt. Every day our agents watch many at Global Affairs Canada and other foreign embassies in Ottawa get turned away for missing easily overlooked requirements. A lack of communication is very common in this process yet it is crucial in order to be done properly. Indeed, Global Affairs Canada and just about every embassy is very difficult to reach as the sheer volume of people going to them for assistance causes a delay for everyone. In short, if you are not there in person then the likelihood of resolving any issues or miscommunications is low. The fact that we have built close relationships with Global Affairs Canada and consular staff at almost every embassy in Ottawa further facilitates this crucial communication and our knowledge and professionalism makes them keen to work with us in comparison to the often frantic and disorganized clients they receive. Many of the people we see turned away end up turning to us for assistance and regret having not come to us sooner. Often they are very close to their deadlines and end up spending more money to get their documents done on time as a result. Our team is here to help you with your Canadian documents for use in Israel. We will take care of every detail, shoulder all the stress, and ensure your affairs are addressed promptly and professionally. Click below to get started with the best company in the industry.